BIG SALE!! CRYSTAL CASTLE PAPERWEIGHTS BIG SALE!! Delicate iridescent Crystal Palace on a Mountain. Luminous peacock colors radiate and vary from every angle. Iridescent crystal paperweight meticulously hand crafted by Austrian Artisans. Exquisitely detailed tiny rainbow castle brings dreams and fantasies to life. A darling decorative piece. Please keep away from young children. Beautiful rendition of an isolated Crystal Lighthouse on a rock island. Little stairs go down to the dock. This is a perfect addition to anyone's lighthouse collection. These imported German iridescent crystal figurines are hand crafted in the old world traditions. Beautiful 5 towered silver crystal castle in amazing iridescent peacock colored dome. Every one's desk is their castle after all. This is a gift you'll always be remembered for. These imported German peacock crystal paperweights are hand crafted in the old world traditions. Mythical fire breathing Dragon is beautifully hand carved out of iridescent crystal. This Crystal Dragon Paperweight adds pizzazz to any one desk and are individually hand crafted by German artisans. Large iridescent crystal paperweight of a prancing Unicorn in a Magic Forest. Hand carved crystal looks like it is rough hewn from a rainbow rock with dazzling peacock color reflections. These paperweights are hand crafted in the old world tradition by German artisans. 30mm Crystal Castle Paperweight seems even more darling because of it's perfect sculpture yet miniature size. The Peacock colors radiate iridescent reflections from every angle. These leaded crystal castles made by German artisans in the old hand crafted tradition. Save $13.95 when you order the Crystal Rainbow and 30mm Castle together. They are the perfect fairytale combination. Lovely German Peacock Crystal paperweight set. 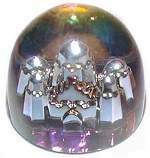 The fantasy Castle in Clouds iridescent crystal paperweight is back in stock! The Cloud base is a frosted opalescent pink and green and the castle is a clear version of the same gorgeous hues. There are five pink tipped turrets, this castle is so pretty it's straight out of a pipe dream!! Lovely medieval fort style Crystal Castle surrounded by 6 towers and a round wall. A wonderful piece for the collector. A gift that will be treasured. 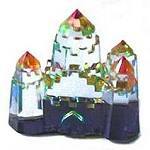 These imported German iridescent crystal castles are hand crafted in the old world traditions. Old world Towered Crystal Castle figurine with fort walls set on rough hewn rock hill. This is a perfect addition to anyone's castle collection. These iridescent crystal castles meticulously hand crafted by Austrian Artisans. Gorgeous Moon & Stars paperweight. A fabulous addition to your desk. Iridescent rainbow colors leap out at you from every angle. Peacock crystal paperweight meticulously hand crafted by Austrian Artisans. 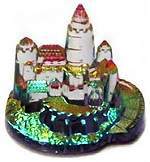 Our dazzling Crystal Palace or Castle Paperweight are back in stock by popular demand! Peacock colors radiate and vary from every angle. Pure Leaded Crystal meticulously crafted by Austrian Artisans.